Cycling Refugium With BioSpira (But why?) 3/14/07 Hi All, <Hi, "D". GrahamT here.> I have set up a 6 gallon Eclipse tank as a refugium for my 10 gallon nano reef. <I love refugiums... and adding volume for that matter.> I started the cycling about 2 weeks ago using a piece of frozen shrimp to get the ammonia in there (Left it in for 1 week then removed). <Wait. You are cycling a refugium? This doesn't compute. If you are adding more volume in the form of a refugium to one system, and it is destined to contain exactly the same water as the main system, then why would we cycle it separately??? (Or at all)> My LFS usually carries BioSpira but they were out and said it was on order. This past weekend I went back only to find they just placed the order and it would be another 2 weeks... so I ordered BioSpira from Drs. Foster and Smith online Saturday P.M. Product shipped Monday, received the package overnight A.M.; products still cold, well packaged great service by the way). I took a reading on the ammonia, nitrite and nitrates and of course they all top the charts. <Well, of course...> I added some of the BioSpira (the 1 oz is for 30 gallons and this is only 6) with plans to add some more later. (Package clipped tightly closed and replaced in fridge.) Then later add some Right Now! by HDLtd which I have found really helps in knocking down the nitrates. <Not sure how that could be. Isn't "Right Now!" a live bacteria (like Bio-Spira)? It doesn't claim to contain any anoxic or anaerobic bacteria capable of reducing Nitrates.> But while doing a search on the WWM site for BioSpira I ran across the sentence...""They, and the microbes in the BioSpira were poisoned, hemolyzed in the fishes' case, by the ammonia..."" So I became confused as to the use of BioSpira and I'm quite possibly misunderstanding the statement. <Nah, that's just Bob trying to scare you into cycling a tank properly. ;)> <<You are perceptive. RMF>> But it has me thinking that by adding BioSpira to a tank high in ammonia I'm killing the beneficial microbes and in fact wasting my time adding the product. Please clarify this for me. If I need to do a water change to dilute the high readings somewhat before adding more BioSpira, please let me know. <This is news to me. Bob has just earned a forward from me. My research on hemolization tells me it can apply to this situation, but is rather vague specifically with the microbial "form". Hemolyzed red blood cells are ruptured, not sure how ammonia does this, but I am not a bio-chemist. This one is for Bob.><<Way too much ammonia/ammonium presence will kill beneficial microbes... cause hemolysis (in animals with RBC's natch). RMF>> I was running a carbon filter. I removed the carbon bag before adding the BioSpira. <Not necessary, will not filter out anything that Bio-Spira metabolizes, and can actually provide a ton of surface area for the bacteria to live on.> (Whisper inside filter because of the low water level... below bulkhead and left the bio-filter in place) The refugium has a 4-1/2" sand bed and that is all that's in the refugium at this time. I know I need to have all parameters in this tank identical to my main tank before even considering tying them together. <The simplest way to achieve this would be to fill it with water from the display and some substrate, immediately tying them together.> I have some extra live rock from rearranging my main tank which I plan to add after the ammonia, nitrite & nitrate levels are to 0. Then I'll add Chaeto. Should I put a cleanup crew in my refugium? Move a couple snails and/or a hermit crab; was thinking to order some brittle stars to put in there. <Not necessary, doesn't hurt unless you worry about competition from the hermits for pods.> The live rock has bristle worms and Gammarus shrimp already. Love the Gammarus shrimp... highly entertaining and excellent scavengers. Afterwards, my thoughts are during my main tank water changes to remove equal water from refugium and replace it with the removed water from the main tank. Should I do this for a week or two before tying them together? <Would do it once and have done with it altogether. I think it's good that you worry about the condition of the 'fuge, but I think this could be going faster and smoother if you just tie-in to the main display and let everything equalize. The system wouldn't spike if you had started this way, but now you don't want to introduce the elevated levels of ammonia, nitrite and nitrate into your main system. Live and learn. I would be more concerned doing it this way that your 'fuge is chemically different in many ways from the display, and when you finally do "join" them, there will be a period of accelerated acclimation. That said, I think you'll still be fine, because you have a plan and you know what to look for. Good luck! -GrahamT> Thanks again. Regards, Debbie P.
Question on Hair Algae Tufts and Cycling 4/6/06 Hi Mr. Fenner, <Hi Howard - Tim answering your question today.> I really enjoy your website and have picked up a lot of useful information! My question regards excessive green hair algae tufts growing in a new tank. My new 25 gal. Florida live rock tank is now on day 15 and contains 25 lbs. live sand and 25 lbs. aquacultured live rock with myriad life growing on it. I'm using a Remora skimmer, 2 X 160 gph. MaxiJet powerheads for circulation (just replaced the ZooMed 270 GPH PowerSweep), a small Whisper power filter with Seachem Matrix carbon in a small bio-bag just for picking up larger particulates and water clarity, and a 2 X 65W PC Corallife Aqualight with (1) 10K and (1) 50/50. I've done several small 10-15% water changes using RO/DI water and Seachem Reef Salt as well as the boxed Catalina Seawater and also dosed daily with SeaChem's 'Stability' to assist the cycling during the first 8 days. The free ammonia level never exceeded .5 PPM during the cycle and nitrites topped out at about 25 PPM for a day or two before dropping quickly. 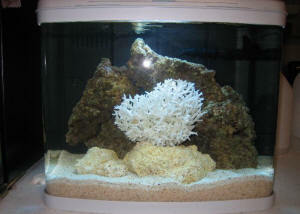 The tank has now just about finished cycling with the following water parameters: PH ----8.2 Alk. ---11.2 SG --- 1.0255 temp --- 75.5 - 76.5 free ammonia ---0 PPM nitrite -----0 - .1 PPM nitrate ----3-5 PPM (has varied a bit from day to day) During the first week or so I ran the lights about 5-6 hrs. per day, but now have them on about 10 hrs. per day with the 50/50 coming on 1 hr. before the 10K and going off 1 hr. afterwards. The tank is also near a large bay window in a bright room but doesn't really receive any direct head on sunlight during the day. I have been diligent in trying to keep my water parameters good and have not fed the tank anything nor added anything else with the exception of a very small amount of Seachem Reef Complete and Reef Trace only once or twice between water changes. I don't think either one of those would have added any bad nutrients to contribute to algae growth. I also top off daily using bottled distilled water. About a week or so ago, I saw some small areas of brown slime type algae on the back glass and small light patches of green hair algae growing on nearly all the glass as well as on some of the rocks which I though was ok and a normal part of the cycling process so I wasn't concerned. Within the past week or so however the green hair algae tufts have really started to take over the tank and is now growing very thick on the front and back glass mostly in small thick tufts that almost resemble numerous hair plugs. Large areas of my rock are now also covered with thick patches of the same, as well as small areas of dark red hair algae growths, and I'm worried that it's starting to smother out the other life on the rocks. The green hair algae is so thick on the front glass that it nearly completely obscures you from seeing inside the tank. Is this type of hair algae breakout normal in a new tank and should I begin trying to manually remove it from the glass and rocks or just let it run its course and hope it subsides? I have delayed in receiving the rest of my rock package and clean up crew until I can get a handle on this hair algae issue. Any advice you can offer, or advise what I'm doing wrong would be greatly appreciated! Thanks very much. 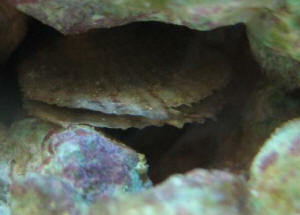 <This is a very common problem experienced by the majority of marine aquarists. As such, there is a wealth of information on this topic to be found on the website - simply do a search for "Green hair algae" using the Google search feature. 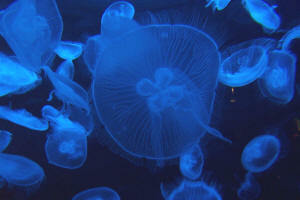 Alternatively have a look at this site and the links contained therein http://www.wetwebmedia.com/algaeconMar.htm. Best of luck.> Regards, Howard W.
Biological Filtration/Bio Spira 3/19/06 Hello, <Hello Czarina> Advice needed here! Two of the fish stores near to us have said very convincingly that using Bio Spira nitrifying bacteria, at the same time as adding 3 larger fish (i.e. not damsels, but rather straight to a small puffer, a tang, and something similar) prevents the need for cycling the tank in advance. Everything I have read states that there is no way to avoid cycling- so I am truly confused as to whether this is a truly viable option, or whether this is indeed risky- and will most likely result in the demise of the fish. <I have mixed feelings about products like these. There are factors such as shelf life, temperature extremes, etc, that can have an effect on the bacteria in the product. I've always let my tanks cycle the natural way, felt more comfortable doing so. James (Salty Dog)> Please let me know what to do! Kind regards, Czarina.